On 10-7-17 at approximately 1:40 p.m., Winter Haven Police received a traffic complain of a blue Ford Mustang being driven erratically weaving all over the road in the1st St NE and Lucerne Park Rd area of Winter Haven. Officers arrived in the area and found a vehicle matching the description pulling in to the Home Depot parking lot (2000 8th St NW). Officers made contact with the driver, 39 year-old TJ Richard White of Polk City. White was sweating profusely, avoiding eye contact and had extreme nervousness. K9 Logan alerted to narcotics in the vehicle after an open air sniff of the outside of the vehicle was conducted. 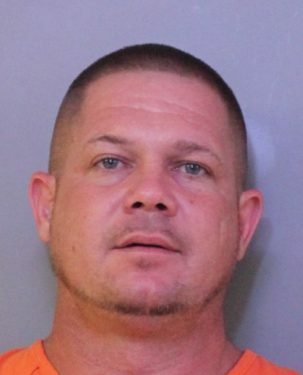 A subsequent search of the vehicle was conducted where more than 35 grams of cocaine was located along with anabolic steroids that he did not have a prescription for as well as scales, baggies and more than $2,100 in cash. Additionally, there was a 25 count pack of Winchester shotgun shells found. White is a convicted felon and is not allowed to have any ammunition in his possession.